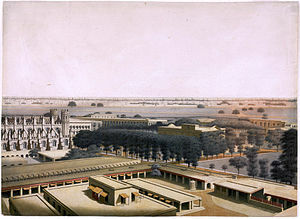 The College of Fort William emerged as both a centre of research and a publication unit, a cradle of creativity as well as scholarship. Planned originally to train probationer British civilians in the languages and cultures of the subjugated country, the college rendered services tantamount to those of a university in promoting modern Indian literatures, Bengali in particular… Under the leadership of William Carey, the College could also claim credit for drawing together Sanskrit pandits and Perso-Arabic munshis to reshape Bengali prose… The variety of the College’s publication also deserve note. From colloquies and popular stories, chronicles and legends, to definitive editions of literary texts. ↑ ক খ Majumdar, Swapan, Literature and Literary Life in Old Calcutta, in Calcutta, the Living City, Vol I, edited by Sukanta Chaudhuri, pp. 107–9, Oxford University Press, আইএসবিএন ০-১৯-৫৬৩৬৯৬-১. ↑ Reader in Comparative Literature at Jadavpur University and Director of the Indian Cultural Centre at Suva, Fiji. Ref: Calcutta, the Living City, Vol. I, edited by Sukanta Chaudhuri, p. vii, Oxford University Press, আইএসবিএন ০-১৯-৫৬৩৬৯৬-১. ↑ ক খ গ Sarkar, Nikhil, Printing and the Spirit of Calcutta, in Calcutta, the Living City, Vol. I, edited by Sukanta Chaudhuri, pp. 130–2, Oxford University Press, আইএসবিএন ০-১৯-৫৬৩৬৯৬-১. ↑ Sengupta, Nitish, 2001–02, History of the Bengali-speaking People, p. 212, UBS Publishers’ Distributors Pvt. Ltd., আইএসবিএন ৮১-৭৪৭৬-৩৫৫-৪. ↑ ক খ গ Mukhopadhyay, Prabhatkumar, Rammohun O Tatkalin Samaj O Sahitya, 1965, pp. 47–51, Viswa Bharati Granthan Bibhag (বাংলা). ↑ Cotton, H.E.A., Calcutta Old and New, 1909/1980, p. 271, General Printers and Publishers Pvt. Ltd.
↑ Cotton, H.E.A., p. 544. ↑ Sengupta, Subodh Chandra and Bose, Anjali (editors), 1976/1998, Sansad Bangali Charitabhidhan (Biographical dictionary) Vol I, p. 112, আইএসবিএন ৮১-৮৫৬২৬-৬৫-০ (বাংলা). ↑ Acharya, Poromesh, Education in Old Calcutta, in Calcutta, the Living City, Vol I, edited by Sukanta Chaudhuri, pp. 108–9, Oxford University Press, আইএসবিএন ০-১৯-৫৬৩৬৯৬-১. ↑ Sengupta, Subodh Chandra and Bose, Anjali, p. 196. ↑ Sengupta, Subodh Chandra and Bose, Anjali, p. 64. ↑ Sengupta, Subodh Chandra and Bose, Anjali, p. 391.